Why did I squirrel? Well… because there was something about this one that was calling me, from that blurb. Claudia found it (she had been waiting for it to go on sale) and she and I often love the same books (often more serious, deep stories of marital and adulthood angst) so I was especially happy when she pointed it out. And the fact that it was on super-sale had me one-clicking it and maybe… hoping for a bit of a psych-thriller ride. I couldn’t quite tell from the blurb, but I dipped a toe in, just to see if it might be what I was in the mood for. Right from the start, it was giving me stomach cramps. Making me so nervous… I couldn’t tell where it was going to take me (other than obviously on an emotional high and obvious downward spiral) so I couldn’t help myself but continue. …he pressed his pick into a string, bending it down and making it quiver like a drop of water before it falls, then released it. It shot like an arrow straight to her heart. Later, that was what she remembered. A sizzle of electricity shot through her body, and she was seared. One split second, and she would never be the same again. Lily stiffened. How dare she? Who did she think she was? JJ barely glanced up; he was tapping his monitor with the toe of his boot. Maybe she was just a fan. She probably thought she was his biggest fan. Well, she wasn’t. Lily was the best fan. No one could be a better fan. but then *sigh* the mood changed. It turned into a “You” (<— barely that… now THAT would have been fun!! :P) meets “Eat, Pray, Love” feel. Fanatic, Lily thought, that’s what I am. An obsessed, middle-aged groupie fan. I mean, I was wondering if she was going to become the groupie from hell (and quite titillated at this prospect), or if it was going to be about a woman’s personal journey during what most would consider a mid-life crisis. Was this true of her life, too? Had she sealed herself into just a teensy-tiny existence in which to maneuver? Maybe even a bit of both? She wanted a second chance, a chance to do it all over. An extra life. A whole separate extra life. And she wanted it desperately. Greedily. Maryse: …I squirreled temporarily…. and I think I might end up loving it… At first for a few seconds I was all… ummm…? And then I clued in. But this is starting to twist, my friends. I’m still in the first quarter so I can’t be sure, but I don’t know that this is a love story or not. In fact, this might end up being some sort of psychological thriller, or maybe just a HUGE personal breakdown… ’cause she’s becoming obsessed with him, and it’s totally messing with her. I just felt like I needed a bit of a thrill ride… like of the intense maybe “bad for you” kind… And I really feel her, you guys… like I’m worried and stressed but I can FEEL her. You know I love me some psych-thrillers and I haven’t read one in weeks. So this… this one was calling to me and it’s tickling my fancy. You KNOW when you’re in the mood for something specific, even though your TBR list says something else is next? You just… you. just. can’t. Not until you get it out of your system. So the psych thriller potential crazy 49-year old groupie stalker chick is up… and it just keeps getting better. I am SO into it. 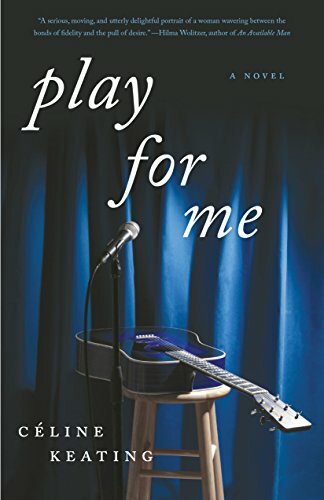 Anne: Maryse Play for Me sounds like a great read and different! I like that the MC’s are in their 40′s. Maryse: *sigh* It was exciting but once I hit the 35 to 50% mark it’s slower than I like it to be… I shall continue. bev: Maryse. We shall send provisions. Godspeed. Maryse: Maybe I need to squirrel yet again? We were being silly… but it’s true. Her obsession was making her unhappy, but what scared her more was the suspicion that life without it might feel worse. What if she liked living in her fantasy better than she did in her regular life? …was for the most part, gone. I finished it though. It certainly changed into more of a personal journey of life lessons, and difficult decisions and consequences. All good I suppose, but not what I was expecting. The more mature writing style (<— this is really hard to explain why I’m describing the writing style this way, and what I mean… it just gave me an out-of-my-reading-element feel). Constantly in the main character’s head (which I normally enjoy), and did often enough here too… for the relevant, deeper, thoughts, and yet after awhile… I could no longer feel connected to her. At least… not how I need to be connected to “love” a book. Was she just inventing all this angst out of thin air because her life lacked excitement? But it often lagged, too. Detail and observations and introspection that lacked a certain connection, for me. She had such a desperate quality to her that just made me so uncomfortable. Not titillated. More… irritated. That said, I enjoyed it for the most part. I mean, hey!! There were certainly moments of excitement, butterflies, OH-NO-HE-DIDN’TS and anguish, too! But they were just so… UGH!!! Him, her, the girl-singer… all of ’em. Even the husband was… fine I guess but… ugh. I dunno. But once I re-established myself into the mood (and actual direction) of the story, I liked it well enough and wanted to see where she ended up in her life. Yes it was angsty, and yes it was emotionally devastating to the characters involved. Just not so much to me. There was a quality to the narration and to the main character’s internal dialogue that eventually had me guarded and at arms length. I didn’t really like… anyone (most of them were all self-absorbed jerks!). Not even her, really. I felt her, to an extent, I get it. Mistakes, and even some for the “eventual betterment” of ones life and all that. I’ve read books like this that no matter how much I should have rallied against the heroine, I still bonded with them and had a love-hate relationship with the journey (yet loved the story). But in this one? Not so much. I suppose my bond was never fully forged and eventually… dropped off altogether, and left me sort of… blowing in the wind. Indifferent to it, as a whole. I tried so far to read Play for Me. I got about 7% in and just wasn’t feeling it. I could not relate to the female lead (I can’t even recall her name). Maybe some other time. I picked up 53 Letters for my Lover . . . Hope this does it! Oh I LOVED 53 Letters!!!! YES!!! I was determined to finish, since so many have been DNFs for me this week. I agree. 3-3.5 stars for me. Had some great stuff, but didn’t go where it could have. In serious need of an epilogue. I was left kind of unsatisfied overall. I’ve been on a Julie Garwood kick. Having re-read all her Historical romances once again. Scottish Highlanders anyone. I forgot how great of a writer she is. Who can forget The Bride. One of her best. I had not read any of her Contemporary novels. What a treat. I started with ” The Ideal Man”. F.B.I. and Military Men ooh My. I was hooked. No I have read Sweet Talk, Hot Shot, Heartbreaker, Mercy and Kill Joy. The Storylines are amazing, fast paced, steamy and Alpha Males. I’m currently reading Murder List. – I’m soo hooked. If you haven’t read any of her Historical Romances or her Contemporary Romances. I totally recommend them. ENJOY ! !